How ironclad is your family’s Thanksgiving menu? Do you follow the exact same recipes year after year for fear of all-out mutiny if you dare to vary? 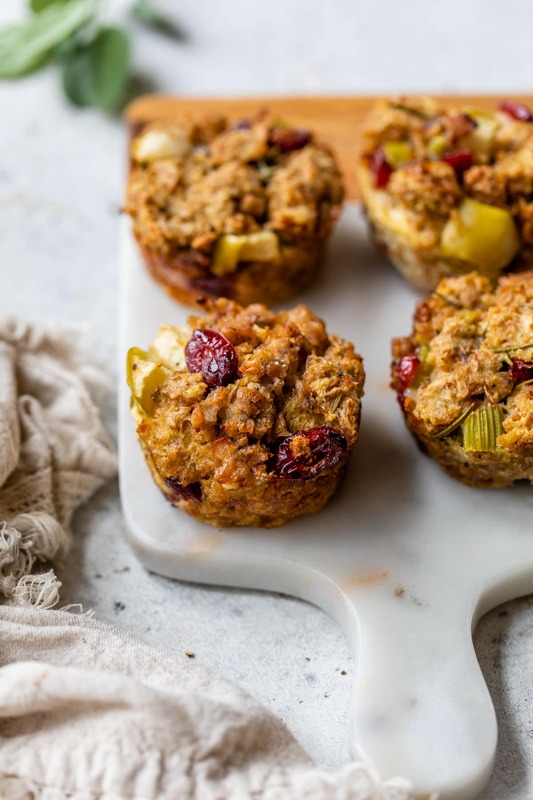 Or do you leave wiggle room for a few playful additions, like today’s Stuffing Muffins? My family, a group of staunch holiday-meal traditionalists, definitely falls into Thanksgiving Menu Camp A. If my mom replaced her Glazed Sweet Potatoes with any other sweet potato recipe (including this incredible Healthy Sweet Potato Casserole), there would be a coup, most likely led by yours truly. Ben’s family is more open to experimentation. While they always serve a lineup of the classics, the actual recipes themselves change from year to year. Although Ben and I won’t be with either of our families for Thanksgiving this year (hiiiiii, we’re in Thailand! ), if we were, these stuffing muffins are exactly what I would bring. 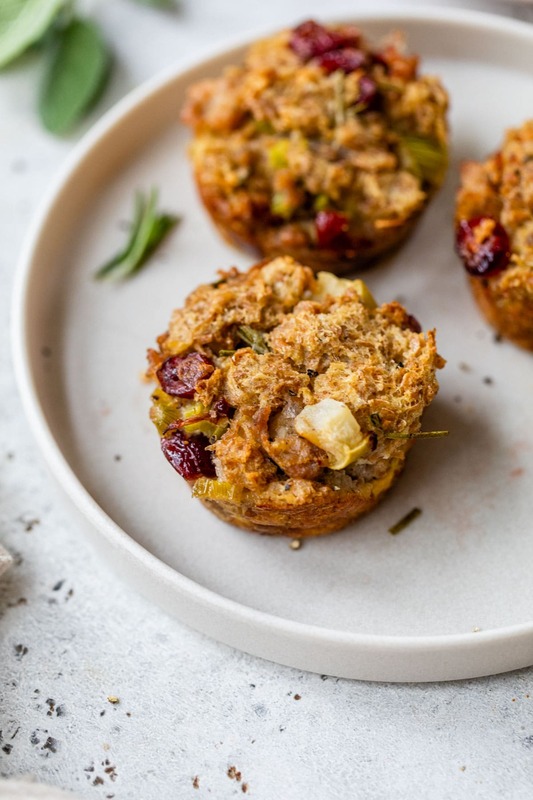 Filled with fresh apples, zesty Italian turkey sausage, and tangy dried cranberries, the Stuffing Muffins’ combination of sweet and savory flavors is so enchanting, it threatens to upstage the turkey. Stuffing Muffins begin like any regular stuffing recipe: dried bread cubes mixed with lots of yummy things. I used a wheat sourdough for its nuttiness and whole-grain goodness. “Yummy things” include the aforementioned apples, sausage, and cranberries, along with celery, red onion, fresh sage, and rosemary. While not all stuffing recipes call for eggs, I personally like to add them, especially when the stuffing is as super-loaded with goodies as these Stuffing Muffins. I used Phil’s Fresh Eggs, the family-owned company for whom I develop monthly recipes. I love that Phil’s chickens are humanely raised in a cage-free environment and fed an all-vegetarian diet that comes from crops raised on the family farm. The result? Higher-quality, better-for-you, and better-tasting eggs. Once the filling is made, it’s time to take a wild step away from stuffing tradition. Instead of baking the stuffing in one big casserole pan, I pressed it into individual muffin tins. This has two benefits. One, everyone gets his or her own Stuffing Muffin (or six! ), which is fun. Two, THE CRUST. One of my favorite parts about any stuffing recipe is the golden crust that forms on top while it bakes. These Stuffing Muffins do us one better: the tops AND sides both form a crust. The contrast of the lightly crispy edges with the moist, fragrant interior is marvelous. Stuffing Muffins can be prepped entirely ahead, then baked just before serving or baked ahead and frozen for up to two months (see specifics in the recipe notes below). I’m also envisioning the leftover Stuffing Muffins at breakfast the morning after Thanksgiving, topped with a runny egg. Can you see it too? 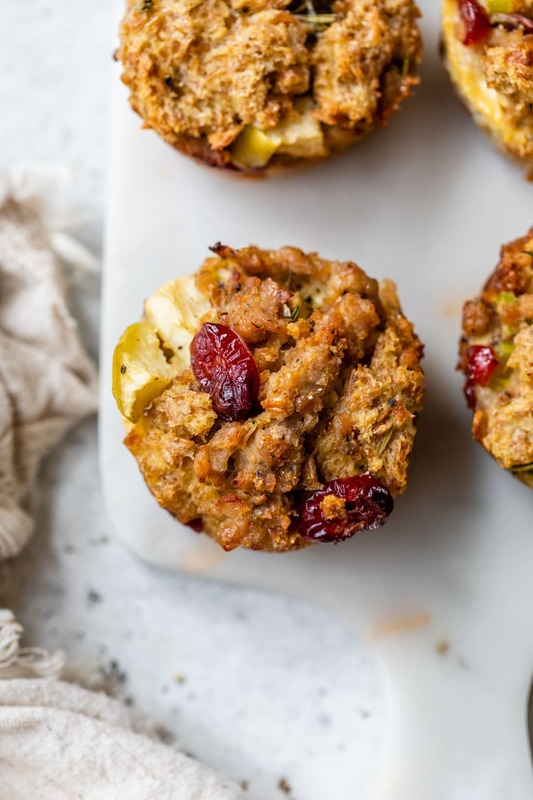 Apple Sausage and Cranberry Stuffing Muffins. 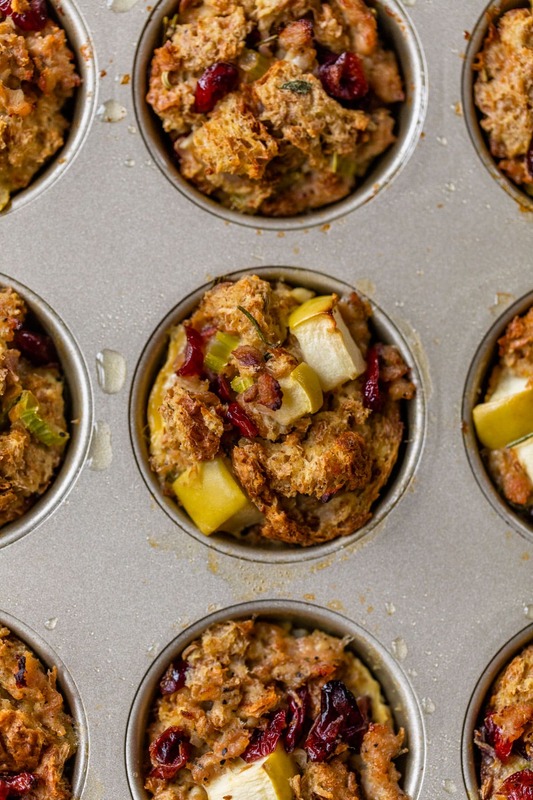 The BEST classic Thanksgiving stuffing, baked in a muffin tin. Delicious crispy edges and easier to serve! Place two racks in the upper and lower thirds of your oven and preheat the oven to 300 degrees F. Spread the bread cubes out in a single layer on two large baking sheets. Bake for 15 minutes, until browned and crisp. Transfer to a large bowl. Generously grease two 12-cup muffin tins (butter work best) or line with paper liners, then coat the liners with baking spray. Set aside. Increase the oven temperature to 350 degrees F.
Heat the olive oil in a large skillet over medium high. Once hot, add the onion, celery, salt, and pepper. Let cook 4 minutes, until the vegetables begin to soften. Remove the sausages from their casing and place in the skillet. Break the sausage into crumbles, turning and sautéing the meat as you go. Once the sausage is broken up, add the apples and garlic. Let cook until the sausage is browned, stirring occasionally, about 2 additional minutes. Place the sausage mixture in the bowl with the bread cubes. In a separate bowl, stir together the chicken broth, milk, and eggs until combined. Pour over the cubes. Add the cranberries, sage, and rosemary, then stir gently with a large spoon, tossing the ingredients until they are well distributed and the bread is evenly moistened. Spoon the mixture into the prepared muffin tins. Firmly press down on the tops of the bread cubes so that they touch the sides of the muffin tin (this adds a delicious crunch to the exterior and keeps the muffins from falling apart). Spoon more stuffing on top and press again. Bake the stuffing muffins at 350 degrees F for 25 to 28 minutes, until lightly browned and set in the center. Let cool in the pan for 10 minutes, then run a knife around the outsides to loosen them. Transfer to a wire rack. Serve warm. To prep the Stuffing Muffins ahead: Toast the bread cubes (Step 1) and saute the apple-sausage mixture (Step 3). Store the bread cubes in an airtight container at room temperature and the apple-sausage mixture in the refrigerator. The day you plan to bake the muffins, stir together the rest of the ingredients and press into the muffin tins. You can then refrigerate the muffin tins, unbaked, for up to 4 hours, then bake as directed. If the stuffing comes out of the refrigerator cold, you may need to add a few minutes to the baking time. To freeze the baked Stuffing Muffins: Allow the muffins to come to room temperature, tightly and individually wrap them in plastic, then freeze for up to 2 months. Let thaw overnight in the refrigerator, and when you are ready to bake, allow the muffins to come to room temperature. Place the room-temperature muffins (unwrapped) back into a lightly greased muffin tin, then reheat in a 350 degree F oven for 10-20 minutes, until warmed through. Perfectly sized portions! Looks delicious! Yummy! hey girl this looks really tasty! Different is good! I agree! Thank you, Shawnna! I made this tonight for our second thanksgiving at home, and they smell sooooo good! I only have one muffin pan so I put the rest in a loaf pan. Can’t wait to dive in! Do you think this recipe can work if I don’t add the sausage and keep it meat free? Hi Taleen, yes, I think you could try this without the sausage. I haven’t experimented with it myself, but you may want to bump up the spices slightly since the flavor and spices in the sausage won’t be present. I’d love to hear how it goes if you decide to give it a try!